It looks like I owe some people a Texas Burger. Excellent. Not at all to my surprise, I quickly received correct identifications of my destination after I departed Hengyang. 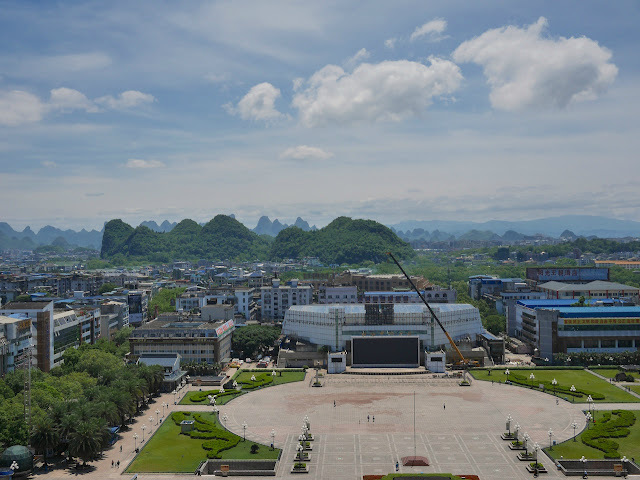 To celebrate, here is a photo from today taken from the same vantage point in Guilin, one of the cities in the Guangxi Zhuang Autonomous Region with a eye-catching mix of urban scenes and karst topography, as the photo in the previous post, though facing a slightly different direction and sans McDonald's. I felt inspired to take another photo because of the good weather and the "good" air. I use the quotation marks because if these air quality readings had been taken in the U.S. they would be classified in the "good" category for air quality as determined by the Environmental Protection Agency. The air has been much worse on average during the past week. The good air today was also notable because of its contrast with the air far to the north, including in Beijing, where it is "crazy bad" now. Guilin has had "unhealthy" air recently but hasn't approached anything like that.